Over the past couple of weeks, I’ve been really busy writing articles for a couple of other websites, as well as trying to keep up with my own blog. If you follow me on facebook, twitter or instagram you’ve probably seen the links I’ve posted to these other articles, but in case you missed them here they are again. On top of this, Spring break is two days away and I’ve been busy getting ready to take the kids on a road trip to visit their cousins. As busy as life can get sometimes, it’s sometimes necessary to let things slide, especially exercise routines. However, I can never let that happen to my Thursday morning bootcamp class. It’s my favourite hour of the week and barring extreme illness (or natural disaster), nothing will stop me from going. It’s a pretty intense workout and after it I’m usually STARVING. I need a healthy,protein rich snack that can be thrown together very quickly before heading out the door to get my daughter from preschool. Greek yogurt with figs and pistachios is what I came up with, sort of by accident, as I was rooting through my fridge yesterday morning. I was just going to chop up an apple and throw it on some yogurt, but then the pistachios caught my eye. 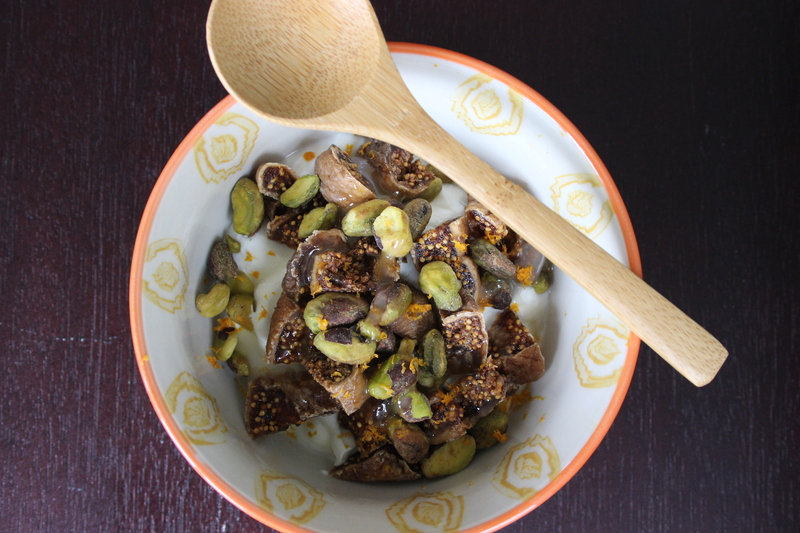 The fig, orange, pistachio combination has been one of my favourites over the last while, but I never thought about throwing them together with yogurt. The result was deliciously satisfying. It all came together in about 2 minutes, which made it the perfect snack for the time crunch I was in. Layer the ingredients, in the order given, in a small bowl and enjoy. What a delicious breakfast! I love the flavours you’ve used here. Yum!